The Storied Lands and Waters report was recently released by the Allagash Wilderness Waterway Foundation (AWWF). The report includes a heritage and cultural resource assessment, interpretive plan and sample lesson plans for educators to use in teaching about the Allagash. Storied Lands and Waters of the Allagash Wilderness Waterway was produced over a two-year span as a collaborative effort between the foundation and the Maine Bureau of Parks and Lands. The principal author of the 300-page book is Bruce Jacobson, the former chief of planning and land resources at Acadia National Park. The report is an important document that will be used by waterway managers to tell the story of the Allagash to its primary visitors — canoeists and fishermen. The report also provides eight sample lesson plans that can be used by Maine teachers and others for education and learning about the prominent features of the Waterway. The book includes a heritage resource assessment, which inventories, assesses and proposes management actions for historic and cultural properties and objects within the Waterway. The interpretive plan has three overarching themes: 1) The Waterway is a wild place set aside for all to enjoy and care for; 2) Flowing waters sustain wildlife throughout the Waterway; and 3) People have lived, worked and traveled in the Maine Woods since ancient times. There are 33 proposed actions in the executive summary. These recommendations are offered to the Bureau of Parks and Lands (BPL) for consideration. This is an exciting opportunity for BPL and the AWWF to work together on the implementation of agreed upon actions. 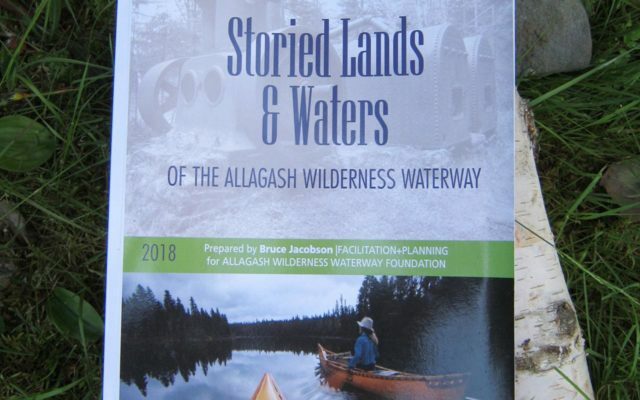 One recommended action that all the stakeholders agree is a great idea, is the development of the “Allagash Explorer.” This pocket guide would be available in printed and digital format that could be downloaded by visitors. The Allagash Explorer would build on the three interpretive themes and provide accurate information about the Waterway’s cultural resources. The Waterway has some important cultural resources that could be highlighted in the Allagash Explorer. First and foremost is the Tramway Historic District, which is on the National Register of Historic Places. Other significant cultural resources include: Telos and Lock dams, Chamberlain Farm, Churchill Depot, Long Lake Dam, Nugent’s and Jalbert’s Sporting Camps, Moir Farm and the fire towers on Allagash and Round Pond Mountains. The report and recommended actions will be used by Waterway managers to guide the implementation of an interpretive plan for the Waterway. The interpretive plan will be developed in coordination with the primary mission of the Waterway, which is: to preserve, protect and develop the maximum wilderness character of the Allagash Wilderness Waterway (AWW). The AWW flows for 92 miles, through one of the most remote sections of forest in the eastern United States. It offers visitors an opportunity to escape from the hectic lives we live and get in touch with nature, and provides an opportunity for solitude. In 1970, the AWW was designated as a Wild and Scenic River in National Wild and Scenic Rivers System. Copies of “Storied Lands and Waters” are available at awwf.org and through the Maine State Library. Printed copies are available at Amazon.com for a modest fee. Matthew LaRoche is superintendent of the Allagash Wilderness Waterway. The waterway is managed by the Department of Agriculture, Conservation and Forestry’s Bureau of Parks and Lands. For information go to: www.maine.gov/allagash or call (207) 941-4014 for an information packet.